Opseg: 5247 stranica u 10 svezaka. Knjige su na engleskom jeziku. H.P. Blavatsky wrote a whole lot during her life in the late 19th century. Her books were and are her best known work. They've been in print ever since. Boris de Zirkoff started collecting his aunt's articles and letters (he was related to Blavatsky) quite early in life and started out making a series of Collected Works, but that material was lost. Then he teamed up with Quest Publications, a publishing house of the Theosophical Society Adyar. They ended up doing the whole series. 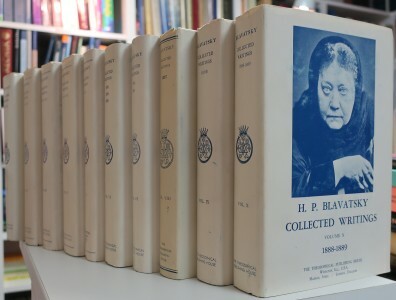 called The Blavatsky Collected Writings. Perhaps most interesting in the series is the collection of fictionalized stories of Blavatsky's travels in India. These were originally published in Russian, and have been translated especially for the Collected Writings series. The result is The Caves and Jungles of Hindostan. A few years after the passing of Boris de Zirkoff John Algeo and Adele Algeo - helped by a team of theosophists of all theosophical organisations - brought out the first volume of the Collected Letters of Blavatsky. Included are (to the chagrin of some theosophists) letters that were probably not written by Blavatsky - but were forged to smear her name. This doesn't detract from the volume in my opinion: each is free to ignore those letters. And even if one doesn't think Blavatsky wrote them, they are still a part of Theosophical History as it unfolded - controversies included.